After Timothy Piazza was taken to the hospital the morning of Feb. 3 suffering from brain injuries and internal bleeding that would result in his death a day later, some members of Beta Theta Pi fraternity at Penn State already seemed to know they could be in deep trouble. "I don't think you fully comprehend the situation," fraternity president Brendan Young said in a text message to his girlfriend. "He looked f—ing dead." Pledgemaster Daniel Casey sent text messages to his girlfriend as well: "I think we're f—ed. Like beyond f—ed. He got up and roamed around. Fell some more times I think just not on the stairs. Parents definitely know. "It's over. I don't want to go to jail for this." Text messages were at the center of District Attorney Stacy Parks Miller's direct examination of a State College Police detective as the preliminary hearing continued for former members of the fraternity and the Alpha Upsilon chapter charged in connection with the death of Piazza, a Penn State student and fraternity pledge. Piazza, 19, suffered non-recoverable, traumatic brain injuries and a life-threatening spleen rupture after consuming large quantities of alcohol at a bid acceptance event at the fraternity house the night of Feb. 2. Piazza fell for the first time, head first down the basement stairs, around 11 p.m. that night. He fell multiple other times on the first floor of the house throughout the night, and is believed to have fallen down the basement steps one more time early on the morning of Feb. 3. After Piazza's unconscious body was discovered by members and pledges that morning, they waited 42 minutes before calling for help. In total, 18 former members and the chapter have been charged with a variety of crimes related to Piazza's death and its aftermath. Two members charged with tampering with evidence have already waived their preliminary hearings. The remaining 17 defendants were back in court on Monday as their preliminary hearing that began on June 12 resumed. Testimony that first day lasted for nearly 11 hours and included three hours of surveillance video footage from inside the house. Det. David Scicchitano continued his testimony on Monday morning, reviewing recovered text messages and answering questions about the alleged roles of each individual defendant in either participating in hazing or attempting to cover up what had occurred. Scicchitano reviewed messages among fraternity members that discussed deleting GroupMe messages and cleaning up evidence of alcohol. He testified about how the brothers organized "The Gauntlet," a series of drinking stations that some members admitted was designed to get pledges drunk quickly and how they allegedly said they knew most of the pledges were under 21 but served them alcohol anyway. And he went into detail about text messages and receipts that showed how the brothers organized and purchased nearly $2,000 worth of alcohol in the week leading up to the bid acceptance night of Feb. 2. Scicchitano's early testimony focused on the text messages involving Casey and Young. Both are among eight members charged with felony aggravated assault and misdemeanor involuntary manslaughter, simple assault and multiple counts of recklessly endangering another person, hazing, furnishing alcohol to minors and unlawful acts relative to liquor. Young and Casey also face charges of tampering with evidence. He read a Feb. 3 text message from Young to Casey, telling the pledgemaster to have pledges clean up evidence of alcohol in the basement, which Casey replied was being taken care of. "They could get us with alcohol [and] guys taking care of [Piazza] didn't call an ambulance right away," Young said in a text message to another fraternity member on Feb. 5. In another text to his girlfriend, Casey, after saying he didn't want to go to jail, wrote "hazing is a huge thing." Scicchitano also read a message from Casey instructing member Lars Kenyon to "End that GroupMe so there's no evidence on Tim's phone." A search of Casey's phone also reportedly found he had searched "how to delete a group on Facebook" followed by searches for news stories about Piazza's death on Feb. 4. 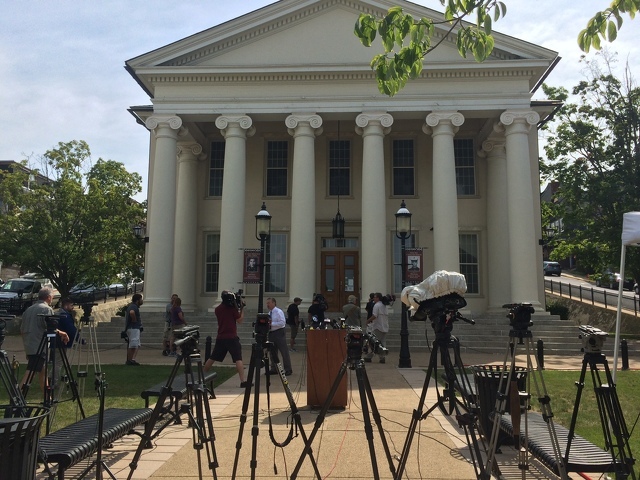 Among charges against them, Young and Casey face a total of 50 counts of hazing and recklessly endangering another person and 48 counts of furnishing alcohol to minors, encompassing their alleged roles in fraternity rush events in the spring and fall of 2016 as well as for Piazza's pledge class in 2017. Parks Miller's questioning sought to identify the roles of each member who has been charged, including who was identified as having served alcohol to pledges during "the Gauntlet." Two defense attorneys objected at points during direct examination that the prosecution had "cherry-picked" the video and text messages that had been shown. The entire record of messages and video should be entered, they argued. When Parks Miller mentioned Piazza's second fall down the basement stairs the morning of Feb. 3, which was not witnessed or captured on video, Ted Simon, attorney for member Luke Visser, said there is no evidence that Piazza had fallen down the stairs a second time. Simon contended that a segment of the video, recorded between 7 a.m. and 7:15 a.m. shows Piazza twice getting up and displaying cognition. That section was not shown in court. He said the video should be shown. Parks Miller called the claim a "bald-faced lie" and said circumstantially there was no way Piazza could have made it down the basement stairs at that point without falling. "I don't need to play the tape to respond to your lie," Parks Miller said. Scicchitano testified that Visser, Jonah Neuman, Nick Kubera, Michael Bonatucci, Gary DiBileo and Joe Sala each played a role in running "the Gauntlet," where the pledges quickly went from station to station quickly consuming vodka, beer and wine. Like Young and Casey, those six also are charged with felony aggravated assault and misdemeanor involuntary manslaughter, simple assault. They also face 14 counts of recklessly endangering another person and hazing and 12 counts of furnishing alcohol to minors. According to Scicchitano, DiBilieo and another member who was not charged, Greg Rizzo, told police that they suggested to other members that they should call 911 when Piazza fell the first time because they were concerned about his level of intoxication. Ultimately, they said, they deferred to the fraternity's executive officers to decide. In a Feb. 3 text message to DiBileo, Rizzo wrote, "It's not the fact that he drank. Like he drank because we hazed them, too. Main word being hazed." "We tried our best to get him to the hospital," DiBileo replied. "I wish people would've listened." Scicchitano also discussed messages, receipts and interviews concerning the purchase of alcohol for the bid acceptance night, as well as three rush events in January. Four members -- Michael Angelo Schiavone, Craig Heimer, Lars Kenyon and Parker Jax Yochim -- are charged with 14 counts of recklessly endangering another person and hazing and 12 counts of furnishing alcohol to minors for allegedly coordinating the purchase of alcohol for the events. Prosecutors have noted that Beta Theta Pi described itself as a dry fraternity, and Penn State Interfraternity Council rules prohibit alcohol at rush events. Text messages shown in court show potential pledges being told to cover up wristbands identifying them as taking part in the rush process when they were invited to attend rush events where alcohol was being served. Schiavone was the fraternity's risk manager and collected members' social dues for what was dubbed the "slush fund" used to buy alcohol, Scicchitano said. Heimer made purchases of vodka, wine and beer for the fraternity events in January and the bid acceptance night, according to text messages, receipts from a beer distributor and liquor stores, and what Scicchitano said Heimer told investigators. Kenyon and Yochim, meanwhile, were part of the fraternity's social committee that decided what alcohol to buy and provided the money to Schiavone, Scicchitano said. Ryan McCann, Lucas Rockwell and Braxton Becker are charged with tampering with evidence. Joseph Ems is charged with recklessly endangering another person. McCann is the member who finally called 911 at 10:48 a.m. on Feb. 3. McCann and Rockwell were among those who lifted Piazza to his feet in an effort to get a shirt over his head that morning. Rockwell reportedly told police that Piazza's breathing was labored and that he had a cut on his face. Scicchitano said McCann told police that Piazza's breathing seemed fine and that he "diminished any injuries." McCann also allegedly said it was only about 10 minutes from the time Piazza was brought up from the basement to the time he called 911. It was 42 minutes, according to video evidence, and during some of that time McCann reportedly searched on his phone for things such as "falling asleep after head injury" and "cold extremities in a drunk person." McCann did not mention in the 911 call that Piazza had hit his head or that his body at that point was rigid. "He said he knew the minute he called 911 they were going to get shut down," Scicchitano testified. Beta Theta Pi had its recognition permanently revoked at Penn State in March. The national organization disbanded the Penn State chapter and the chapter's alumni board evicted the former members from the house at 220 N. Burrowes St.
Testimony continued Monday afternoon with defense cross-examination of Scicchitano getting started. Geoff Rushton is managing editor for StateCollege.com. Contact him at [email protected] or find him on Twitter at @geoffrushton. It's that time again, award watch list season is upon us. 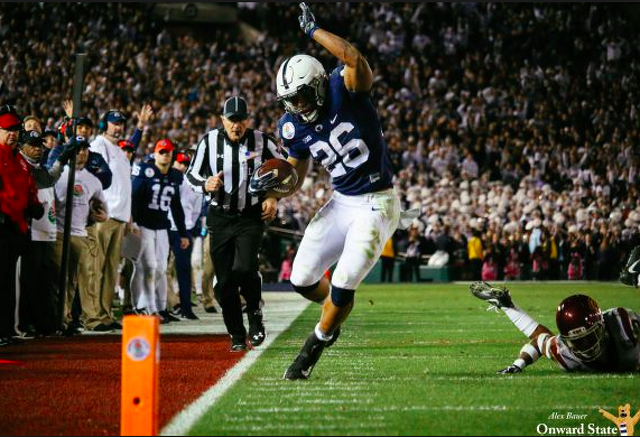 And Penn State football has started off the season strong with four players named to the watch lists for the Maxwell Award and the Bednarik Award, which were revealed Monday.